The unique testing process developed with Hohenstein tests the sun protection factor of textiles in a practice-focused and realistic manner under typical usage conditions and makes an important contribution to consumer safety. 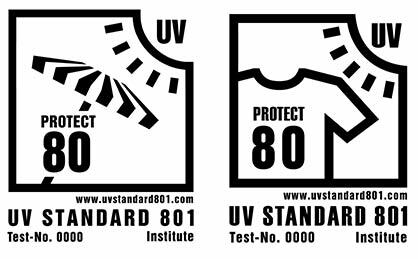 2018 marks the 20th anniversary since the introduction of UV STANDARD 801. This test process calculates the UPF (Ultraviolet Protection Factor), which is used to specify the sun protection factor of textiles. The standard was developed and founded in 1998 by three testing institutes: the Hohenstein Group, the Swiss textile testing institute TESTEX and the Austrian textile research institute OETI. The three founding members had already recognised the need for a practice-focused and significantly more realistic testing and certification of clothing and shading textiles. This is because the other methods and standards, which are still used internationally today, are limited to only testing the UV protection factor of textiles in their brand-new condition. The conditions, strains and stresses that occur with respective use are not considered in these tests. Unlike in the UV STANDARD 801: It tests the UPF of a textile in a defined manner, even under typical usage conditions. For swimwear and sports clothings, this could be, for example, aspects like the stretching and dampening of the textile, the wear and tear caused by washing and the age of the textile. For shading textiles such as blinds, diverse weather conditions must be considered. Only a textile that has been tested with UV STANDARD 801 can therefore offer reliable sun protection, even in its everyday usage condition. With textiles labelled with the UV STANDARD 801, consumers can thus be sure that they are purchasing high quality products and will be protected even in the “worst-case scenario”. Textiles are almost predestined as UV protection: By using a suitable material composition and construction, i.e particularly closely woven special fibres, they can effectively protect children’s sensitive skin from intense UV rays, for example. This is beneficial, as children only first develop their own, complete UV protection mechanisms during puberty. When spending longer periods outdoors, prevention is generally offered - not just during sport and leisure activities. Furthermore, people who frequently work outdoors have a significantly higher risk than other professional groups of contracting so-called “white skin cancer”, which is caused by solar radiation and is officially recognised as an occupational disease. Indeed, there are already prominent, forward-thinking manufacturers that offer appropriate workwear. Yet this potential has not yet been fully exploited. The issue of UV prevention is gaining increasing priority due to measurable and noticeable global climate change. The intensity of solar radiation is steadily increasing, even in European latitudes. Tested “clothing with integrated sun protection factor” is now no longer a niche product. Heightened consumer awareness means that the demand for effective protective measures is continuously increasing. On this jubilee year, the Hohenstein Group would like to sincerely thank all partners and loyal customers that have helped to establish this unique global standard over the last two decades. Throughout this time, the UV STANDARD 801 testing community also has grown strong. It now comprises 8 testing institutes throughout Europe. The following have joined the 3 founding members: CITEVE (Portugal), AITEX (Spain), IFTH (France), The CENTRO TESSILE COTONIERO E ABBIGLIAMENTO (Italy) as well as the Danish Technological Institute (Denmark).